House churches offer a place for people to live out their faith with others. There is no hiding here. You can just show up at a traditional church and no one may even know you are there or even care in some cases. Not so with house churches. A “large” house church would be over 10 people so you can’t hide. We will know your name. We know your life. We will both disciple and challenge you in your faith. This, I believe, was the model of Jesus and should be ours as well. True discipleship is not learning from a book or sitting in a class. True discipleship is taking the “one another” texts of the New Testament and seeking to obey them (there are 52 in the NT). This leads to authentic faith and not merely a show on the stage of many traditional churches. Many people reject going to church because of the emphasis they perceive on money. With the false “health and wealth” churches and the so-called “prosperity” gospel, many are turned off to Christianity because of their false teachers. The house church movement doesn’t want your money. The house churches in China are said to move around quickly. They do this to avoid arrest. I have heard the same of the few house churches in North Korea. Because house churches are not locked down to a building, they don’t need government approval to meet nor do they have to meet all the time in one place. House churches in China often will meet several times a week at different locations to accommodate the needs of the saints. They don’t just meet on the Lord’s Day. Traditional churches will no doubt face sensor from the government. It may come a time where it is illegal to preach against sins such as homosexuality (it will be viewed as discrimination or gender bigotry). The government will monitor the traditional church (as they do in China). Traditional churches will have to comply or be gone. I could write an entire series on the errors of the modern clergy-laity driven church. We could discuss so many aspects of modern church life that is foreign to the Bible but nonetheless, we are so entrenched into our traditions that we believe them to be found in the Bible. Sort of like the first time someone challenged me to find the “sinner’s prayer” for salvation in the Bible. I answered about begin saved by faith, justified through faith, believing the gospel, etc. but they challenged me further to show one person who prayed to receive Christ or who was instructed to pray for salvation. I was dumfounded trying to find one person in the book of Acts who was saved by simply praying a prayer. One of the fads in the modern evangelical church in the West are multisite churches. This has become the new desire, to be large enough to meet on various “campuses” around a city. One multisite church I looked at on the Internet has 19 “campuses” for people to meet. Most of these sites are not even in the same states. I know of a church in my area that is sucking the smaller churches dry with a new site that features a church that is nearly 100 miles away. At a multisite church, you come in and you watch a screen of the Bible teacher who could be hundreds of miles away. They count you as being in their church despite never even knowing your name. I know of a man who died while attending one of these multisite churches and a representative from the mega church showed up to tell the grieving family that the superstar pastor would not be able to be there with them but he was thinking about them in their suffering and trials. Yeah right. I honestly don’t get the point of multisite churches other than pride. Why not just plant another church? In reality, multisite churches are just another reflection of the error of modern church gatherings in the first place. Christians today believe that the reason we show up on the Lord’s day is to hear preaching. This is not true. Others believe we meet on the Lord’s day to worship God. This is not true. Some say that we meet on the Lord’s day to be trained through Sunday school or discipleship classes how to live for the Lord. Again, not true. In reality, the Lord’s day was to be a day to meet and eat (1 Corinthians 11:20). For most disciples of Jesus in the early church, the Lord’s day was a work day. Most would have worked all day and so they would meet in the evening around a meal with the Lord’s supper being the main focus (1 Corinthians 11:23-26). Jesus was the Passover Lamb and He was the focus (1 Corinthians 5:7). The Lord’s supper (as part of the meal and not the Lord’s tiny snack) would focus the disciples upon the Lord Jesus as their hope (1 Peter 1:3). The focus of the Lords’ supper would be a gospel focus (Mark 14:22-25). Acts 20:7 speaks of these gatherings. Notice the verse says, “On the first day of the week, when we were gathered together to break bread, Paul talked with them, intending to depart on the next day, and he prolonged his speech until midnight.” Notice that the disciples gathered to “break bread” which is to eat. The eating would have been probably on a floor and not around a table. The custom was to eat with your legs behind you and you facing the others. In this context, people would have been a family, close-knit, and one in Christ. You would have people from various ethnic backgrounds and cultures coming together to eat and to fellowship around the Lord’s table. Rich people would have been on equal footing with the poor (James 2:1-7). In this context, of eating around the Lord’s table, true fellowship and discipleship would have taken place (Hebrews 3:13; 10:24-25). What about preaching? In the book of Acts, we find preaching only toward the lost. In fact, the closest thing we have to church gatherings and preaching is Acts 20:7 and here Paul uses this time because he knows that he will not see these saints again. It also appears that Paul is not preaching here but simply talking. To preach is to raise ones voice (see Acts 2:14). I have no problem with bringing the church together for teaching times but one teacher should not take up the Lord’s day. I find nothing of this in the New Testament. Now to return to my issue with multisite churches. First of all, they don’t obey 1 Corinthians 14:26 at all. Most evangelical churches don’t. House churches can offer the best place for this to take place. Small groups (or cell groups) offer the closest thing we have of this biblical practice in the Bible. However, cell groups often are an extension of the clergy driven church and often are tightly controlled by the traditional church. Secondly, how can multisite churches (or even large churches for that matter) obey Hebrews 13:7? How can I imitate the faith of my elders who live 500 miles from me? How can I see their prayer lives? How can I imitate their marriage? How can I learn how they evangelize or study the Bible? How can I even submit to my elders (Hebrews 13:17)? This can happen in smaller groups only. I know that multisite churches would claim this. But this is not the same as what we find in 1 Corinthians 11 or 1 Corinthians 14. According to multisite churches, we meet to hear the professional Bible teacher who lives miles from me and doesn’t know me or my name. We meet to hear him teach and then we meet in small groups to apply what we learn. Where is this in the New Testament? How can we take this approach to church meetings and apply this to 1 Corinthians 11 or 14? We simply cannot. For more information on this issue, I highly recommend two books. One is Paul’s Idea of Community: The Early House Churches in Their Cultural Setting by Robert Banks. The other is Reimagining Church: Pursuing the Dream of Organic Christianity by Frank Viola. Both are excellent books. 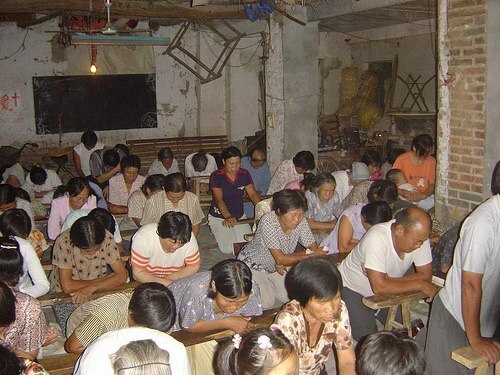 Here is a picture of the saints of God in China crying out in prayer! This picture blessed my heart. This saints of God are crying out and the Lord God is moving mightily in China. Millions upon millions of souls are hearing the gospel and being saved. Pray for China. Pray the house churches in China to continue to see the power of God falling upon them. Our God reigns! I have heard it said that the greatest temptation facing the modern pastorate is the allure to study methods instead of theology. Methodology is what churches unite around now these days. It is not unheard of for liberals to associate with conservatives so long as the methods are the same. It is not unheard of for Pentecostals to go to Baptist churches to study their methods and to learn from them how they do church. And why is this? First, the evangelical church is losing its foothold in the United States. People are walking out the door. Some are going to more liturgical churches because at least in a liturgical church you don’t have to worry about the style of music or hear some hip preacher. It is very consistent and they have been singing the same songs for hundreds of years. There is comfort in that. Secondly, the allure of money. Mega-churches and the seeker churches make lots and lots of money. They are cash machines. This allures to the average preacher who is barely making it. He wants to provide for his family and to see the church grow but rather than being faithful to the Lord and not to money, the preacher begins to study the seeker models or the local mega church and he begins to follow the methods of that church instead of being faithful to just preach the Word. Money wins. And lastly, power. I think many preachers are hungry for power. Who doesn’t want the crowd to notice them? Who doesn’t want people in a local restaurant to notice them when they walk in with their party? Men desire power and it rubs our egos. Yet this is all foreign to the New Testament. The example of Jesus in leadership is one of a servant (Mark 10:45) and He exhorted His own Apostle to not be like the leaders of this world (Matthew 20:20-28). Leadership in the New Testament Church was to be one based not on a position or power but upon being a servant and one that others could follow by their examples (Hebrews 13:7; 1 Peter 5:1-4). Typically, New Testament leaders were described with verbs rather than nouns. They were doing the ministry and not being the minister. Further, the idea that one person is to be the “head” of the Church is foreign. Jesus alone is the King of the Church (1 Timothy 6:15-16). Jesus alone is the Head of the Church (Colossians 1:18). Jesus alone is building His Church (Matthew 16:18; Acts 2:47). Jesus alone is the Shepherd of the Church (John 10:11; Hebrews 13:20). Not once in the New Testament do we find “Pastor Jim” but instead the Lord Jesus is the One that is exalted and He alone is the One that we are to worship and adore. Not a man. Not a group of men. Just Jesus (1 Corinthians 3:4-9). The Holy Spirit raises up leaders in the local church (Titus 1:5) but He doesn’t exalt one person. He only exalts Jesus (John 16:14). House churches then are not caught up in seeking to build “bigger buildings” or “more hip services.” House churches are only interested in fulfilling 1 Corinthians 11:33. Certainly Ephesians 4:11-16 is part of the house church but the emphasis is not upon a pastor or a teacher. The emphasis is first and foremost on Jesus and His kingdom. Secondly, the focus is on edification of the saints (Hebrews 10:24-25). The saints of God go out into the world with the gospel (Matthew 28:19; Mark 16:15; Acts 1:8) as Christ’s ambassadors to a lost world (2 Corinthians 5:20). House churches are not interested in programs or in people attending our meetings to hear the gospel. We want to equip the saints to go out and reach the lost and not bring the lost to a professional teacher to hear a sermon. House churches need not worry about seeker churches or about how to make money because have no paid staff, no clergy-laity system to fund. The money we sometimes ask for goes to church planters (apostles if you will), to help the poor (Galatians 2:10), and to help hurting disciples (Acts 4:32-35; 11:27-30). We require no “tithes and offerings” because we are not interested in funding a job. We are only interested in funding what God asks us to fund and we don’t do this weekly. 1 Corinthians 16:1-4 is not asking people to tithe but to give to hurting disciples in Jerusalem. House churches are a relief to many. They are not interested in your money. They are not interested in you dressing up. They are not interested in allowing one person to use their spiritual gift over others (1 Corinthians 12:7). They are only interested in living out the gospel and preaching the gospel to the lost in the world. We come together not to hear a sermon but to celebrate the Lord’s Supper knowing that Jesus is our Passover Lamb and He died to save us from sin and to equip us by His Spirit to overcome sin, to love the saints of God, and to witness to the world about this great salvation. What’s The Problem With House Churches? For the life of me I have tried over the years to understand how people can oppose house churches. I know some reject house churches because their tradition is that they must meet in a building that they call a “church” in order to have “worship services” that honor the Lord. Others oppose house churches because they are too close for comfort. You can hide in a traditional church but not in a house church (Hebrews 3:13-14). The major complaint I hear from people in the Internet is that house churches lack “biblical” leadership which typically means that the house churches are 1) not part of a denomination or 2) lack one pastor who has been professionally trained for the ministry. #2 is by far the most common answer I hear. House churches, as one critique stated, “Want to play church instead of being the true church.” He said this because house churches lack a clear clergy-laity system where one man leads the flock of God. My response to this is simple. First, the Bible knows nothing of one pastor leading a church. In the New Testament, the Church is led first by Jesus Himself through His Spirit (Acts 13:1-3) and then by elders (Titus 1:5; 1 Peter 5:1-5). The elders must fit the description as found in 1 Timothy 3:1-7 and Titus 1:5-9. We find only elders leading the Church and not one professional elder or pastor. The word “pastor” is found only in Ephesians 4:11 in most English Bibles although the ESV correctly translates the Greek word as “shepherds.” Jesus, of course, is the “chief shepherd” (1 Peter 5:4). Jesus faithfully leads the Church (John 10:11) as the good shepherd or pastor. We find not one pastor in the New Testament. In fact, all titles given to people in the New Testament Church are what they do and not who they are. Paul is an Apostle because that is what he does. We find no Pastor James or Bishop Smith or Elder Joe. Secondly, house churches do have leadership! In fact, every biblical house church will have leaders. Leaders are mentioned in the New Testament Church but their role is not that as found in many modern churches where pastors do all the work, all the teaching, all the preaching, all the evangelizing, all the praying, all the visiting, etc. In fact, only Paul’s letter to the Philippians even begins by addressing the leaders and the Church (Philippians 1:1). You would think that if pastors and leaders in the Church are so vital to God’s program then we should expect to find much about them and the Epistles should be addressed first and foremost to the leaders as the true servants of God. I personally feel that many leaders in the Church are fearful that if they give ownership of the Church to the Holy Spirit then they would lose control. So be it. Let us lose control for the glory of God! God is more than able to build His Church and He is (Acts 2:47; Colossians 2:19). God alone saves for His glory and God alone leads the Church for His glory (Ephesians 3:20-21). My earnest prayer to God is that He would reform His Church so that we would all see that we are all called to be priests unto God (1 Peter 2:4-5; Revelation 1:5-6). The Reformers taught the priesthood of the saints and I pray that we would soon embrace the biblical teaching that we are all called to serve God with all that is in us.